CGI has ruined action movies. A broad statement like that practically begs for qualifiers—like “by and large,” or “for the most part,” or “generally speaking”—but I’m not inclined to walk it back an inch. Whenever I think about it, two examples spring to mind. The first was 1996’s Twister, a silly “storm-chasing” thriller that was hailed as a breakthrough for the way it used CGI to animate bits of shrapnel (and cows) whipped up by tornadoes in rural America. My thought at the time holds true today, even as the effects have grown far more sophisticated: CGI lacks physicality, and thus it lacks any sense of danger. So no matter how detailed the splintered shards of barn and picket fence are, they seem to exist in a world of zeroes and ones, not the world where our heroes worry about getting shivved. That impression was reinforced in 2003, a year that saw two seafaring adventures, Master And Commander: The Far Side Of The World and the first Pirates Of The Caribbean movie, released within a few months of each other. Again, physicality made the difference: For Master And Commander, much of the filming was done on a reproduction of an 18th-century frigate or a full-scale replica of same, all in an effort to give an authentic impression of the creaks, groans, and sheer enormity of being aboard a 19th-century man-of-war. The ships in Pirates were built on barges, and completed using digital effects that were well-integrated with the supernatural beasties on board. After seeing both movies, I was left with the thought that Russell Crowe’s rickety old ship in Master And Commander would make kindling out of the toy boats in Pirates. Stephen Chow seems to understand the limits and potential of CGI action better than anyone. If CGI is fundamentally inadequate in giving realistic action the same punch it has with real stunts and practical effects, then why not go completely in the other direction? The violence and mayhem in Chow’s action-comedies Shaolin Soccer and Kung Fu Hustle are spectacularly unreal, and the audience doesn’t mistake them for reality any more than they would the Warner Brothers cartoons that partly define Chow’s goofball sensibility. CGI has been making the impossible possible for years now, but rarely have films embraced the impossible as fervently as Chow. It’s one thing to have to super-cool curvy bullets in Wanted, but another to have a chain-smoking, middle-aged landlady in curlers dash after gangsters with Road Runner speed. His movies are endlessly elastic, and there’s real artistry in the way he digitally bends and stretches the martial-arts genre into a silly cartoon doodle. Fun as Shaolin Soccer is, with its goofy plotting and bend-it-like-Beckham-never-could soccer-fu effects, it seems in retrospect like mere prelude to Kung Fu Hustle, a much more confident, polished feat of CGI choreography. It’s also a more careful piece of storytelling, throwing one of Chow’s usual knockabout heroes into a surprisingly vibrant, well-wrought tenement setting under siege by marauding gangsters. Most of the hustle in Kung Fu Hustle takes place after a bang-up opening sequence that finds the “Axe Gangsters” dancing and shuffling their way into criminal supremacy. Impeccably dressed in crisply tailored suits and old-timey top hats, they’re like an upscale variation on one of the New York gangs in The Warriors; when they swiftly dispatch a villain who’s just busted up the “Super Crime Fighters” at a police station, they aren’t just announcing themselves as the new villains, they’re doing it in style. Given how beautifully Chow orchestrates that dance sequence, it’s mildly disappointing that it’s the only such number in the film, but his musicality shows up in other places. Set in 1940s Shanghai, where nouveau glamour meets the Old West, Kung Fu Hustle settles on a U-shaped tenement pit colorfully named Pig Sty Alley, a place presumably too poor for gangsters to exploit. The humble denizens of Pig Sty Alley are used to being harassed by the dreaded Landlady (Yuen Qiu), whose screechy voice can literally shatter glass, but a pair of ne’er-do-wells brings them unwanted attention. Those ne’er-do-wells are Sing (Chow) and his sidekick Bone (Lam Chi-chung), who try to impress the Axe Gang by posing as members and roughing up Pig Sty Alley, but the plan backfires spectacularly when the locals, secretly skilled at kung fu, rebuff them embarrassingly. They’re so inept that the real Axe Gangsters move in to conquer the tenement as a face-saving measure, but they meet spirited resistance from the Landlady, her drunken master of a husband (Yuen Wah), and three tenants with complementary skillsets. Kung Fu Hustle follows Sing’s predictable rise from loveably inept no-goodnik to the greatest kung-fu hero the world has ever known, but the film takes its time in raising the stakes, and Chow generously establishes the world beyond his own character. It’s a shame he doesn’t spend more time in the glitzy casinos and clubs that border the opening sequence, but Pig Sty Alley is a marvel of Old Hollywood back-lot production design—accommodating many tenants and the waves of attackers that assault them, suggesting a tight-knit community that’s closed off from the rest of society, and serving as a mighty fortress to be breached in one action setpiece after another. 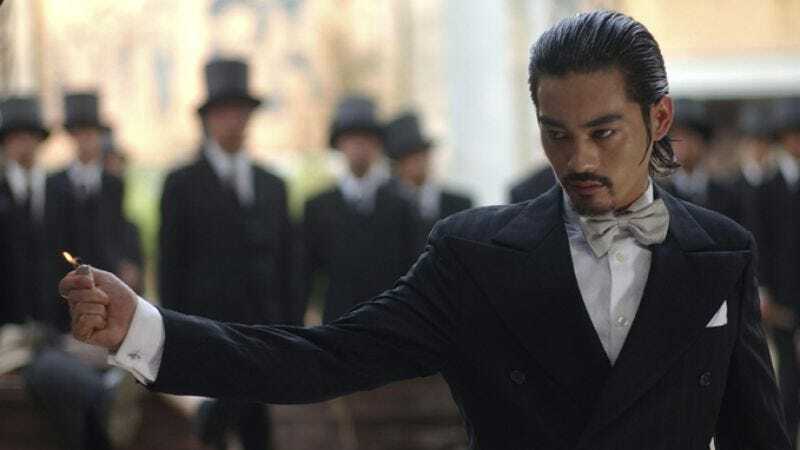 Kung Fu Hustle may be live-action Looney Tunes, but Chow doesn’t get sloppy with the nuts-and-bolts storytelling like he did with Shaolin Soccer; he’s careful in setting up the players and the space, until Pig Sty Alley becomes as much a character as anyone else in the film. So when the action beats come, they aren’t self-contained bits of awesomeness, but part of a well-balanced, satisfying whole. Kung Fu Hustle could be compared to The Matrix in its seamless integration of new-school CGI and old-school wire-fu, and it’s no coincidence that legendary fight choreographer Yuen Woo-Ping had a hand in both movies. Yuen’s high-flying balletics are unmistakable and still beautiful in any context, but Chow uses computer effects to extend them into something new and distinctive, a live-action cartoon that’s firmly rooted in cinematic traditions ranging from Buster Keaton to Tex Avery to the Shaw brothers. It’s a manic, exhilarating—and okay, somewhat enervating—assault on the senses that suggests a more fruitful course for using shiny new computer graphics in action movies. Not that anyone will follow it.